Irene is a category 1 Hurricane with sustained winds of 85 m.p.h. Its effects so far have included 4 deaths in North Carolina, hundreds of trees uprooted, power outages, and structural damage. Structural damage, though minor so far in most places, has also been of a major type including numerous homes destroyed by falling trees and a roof collapsing at a mall. New Jersey Governor Chris Christie just finished making a public announcement in which he made it clear that weather experts are expecting Hurricane Irene to restrengthen to a category 2 storm before it hits New Jersey. 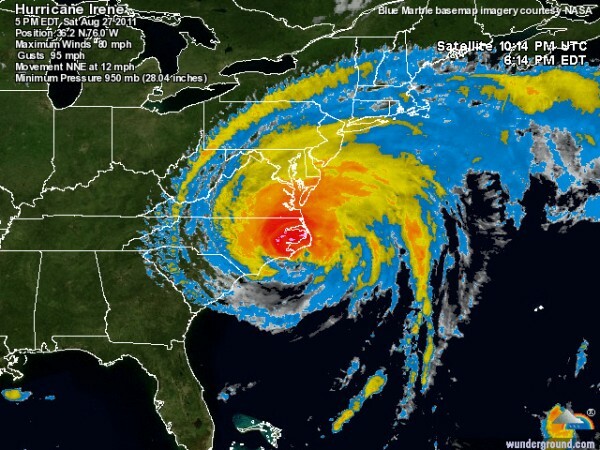 One million people have already evacuated from the New Jersey coast. New York Governor Andrew Cuomo has just announced that he is doubling the number of National Guard troops that will be patrolling the streets. He also reiterated that if you are in a mandatory evacuation zone, you MUST LEAVE. He also said he doesn't want anyone out driving on the streets unless they are evacuating or there is an emergency. 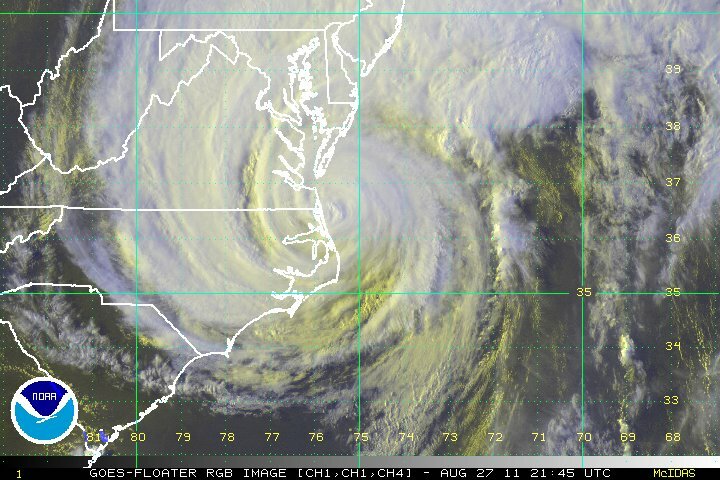 Hurricane Irene roared ashore over Cape Lookout, North Carolina at 7:30 am this morning. The Cedar Island Ferry Terminal measured sustained winds of 90 mph, gusting to 110 mph at 7:19am, and a trained spotter on Atlantic Beach measured sustained winds of 85 mph, gusting to 101 mph at 10:35 am. The Hurricane Hunters measured 80 mph winds over water at the time of landfall. Winds at the Cape Lookout, North Carolina buoy, which the eye passed directly over, peaked at 67 mph as Irene made landfall. At 10am EDT, top winds observed at Cape Hatteras on the Outer Banks of North Carolina were 53 mph, gusting to 73 mph. Winds are rising now along the coast of Virginia, with sustained winds of 56 mph, gusting to 62 mph observed at 10 am EDT at Chesapeake Bay Light. Satellite loops show a large but deteriorating storm with dry air intruding to the southwest. The radar presentation of Irene visible on the Norfolk, VA radar is very impressive - Irene is dropping torrential rains over a huge area. The storm surge and wave action from Irene is likely to cause the greatest damage, and this will be a historic coastal flooding event for many regions of the mid-Atlantic and Northeast. A storm surge of 8.5 feet was reported this morning in North Harlow, NC, and three feet in New Bern, NC. Significant wave heights (the average height of the largest 1/3 of the waves) reached 27 feet at Onslow Bay, NC this morning, and wave heights along the New Jersey shore Sunday morning during the time of high tide are expected to be 15 - 20 feet, according to the NOAA Wavewatch III model (Figure 2.) A storm surge of 3 - 6 feet is expected near Atlantic City, NJ Sunday morning, during the time of high tide. With 15 - 20 foot waves expected on top of this storm surge, there will be tremendous damage to the coast and low-lying structures. 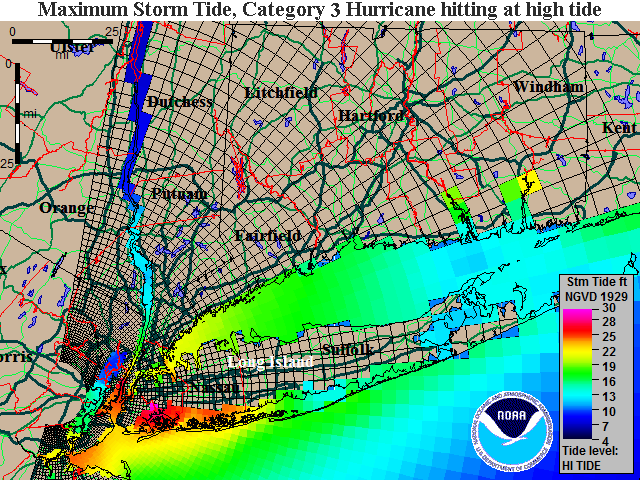 Storm surge is also a major concern for New York City. 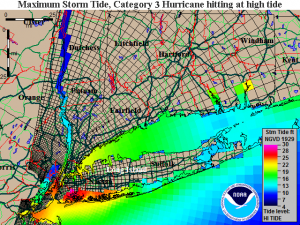 The latest NWS forecast is calling for a 5 - 8 foot storm surge in New York Harbor, which would easily top the flood walls protecting the south end of Manhattan if the storm surge occurs at high tide. High tide is near 8 am Sunday morning. 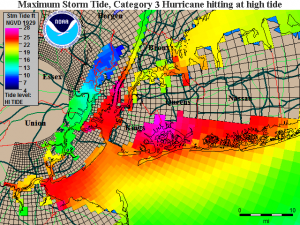 A research storm surge model run by SUNY Stonybrook predicts that water levels at The Battery at the south end of Manhattan will peak at 2.2 meters above Mean Lower Low Water (MLLW) at high tide Sunday morning, which would be about six inches below the top of the flood wall (which is 5 feet above mean sea level.) Waves on top of the surge would likely spill over the top of the floodwall in this scenario, and cause some flooding in southern Manhattan. 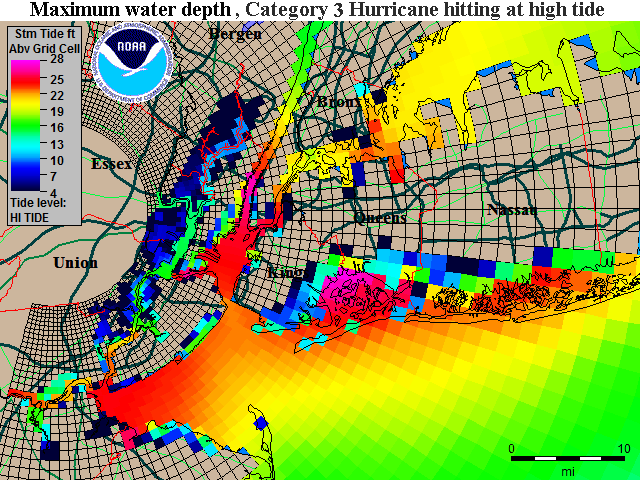 Dot Earth blog has links to a storm surge animation for New York City. Climate Central has a nice satellite image showing which parts of New York Harbor are below five feet in elevation. 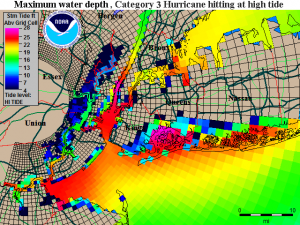 Storm surge heights of up to eight feet are predicted in Western Long Island Sound, and 3 - 6 feet along much of the New England coast from New York to Massachusetts. This is going to be a damaging coastal flooding event for this stretch of coast, though perhaps not as damaging as the one New Jersey will experience. Inland flash flooding and river flooding from torrential rains are a major concern. Latest radar-estimated rainfall amounts in North Carolina already exceed ten inches in some locations. Cedar Island, NC has reported 7.21" as of 11am EDT, and a 100 mile-wide swath of 8+ inches of rain will likely fall from Eastern North Carolina northwards along the coast, through New York City, and into Vermont and New Hampshire during the next two days. Destructive river flooding will be a significant danger from New Jersey northwards to Southeast New York, where soils are saturated and run-off will be the greatest. Apparently, the water level gauges in rivers in the path of Hurricane Irene are already indicating that by early Monday there will be at least TWENTY-FIVE MAJOR RIVERS at or above flood stage. This is why the weather experts are also now trying to gain the attention of those who live inland from the coast. Forecasters warn that even if you are inland, if you live in a flood plane in any of the states under a state of emergency, expect a flood where you are! They also said that there is potential for this widespread flooding to be accompanied by power outages. Irene is slowly deteriorating, but the storm is too large to weaken quickly. The latest wind distribution map from NOAA's Hurricane Research Division (Figure 3) shows that all of Irene's hurricane-force winds are on the storm's east side, so only North Carolina's Outer Banks will get winds of 75 - 80 mph. 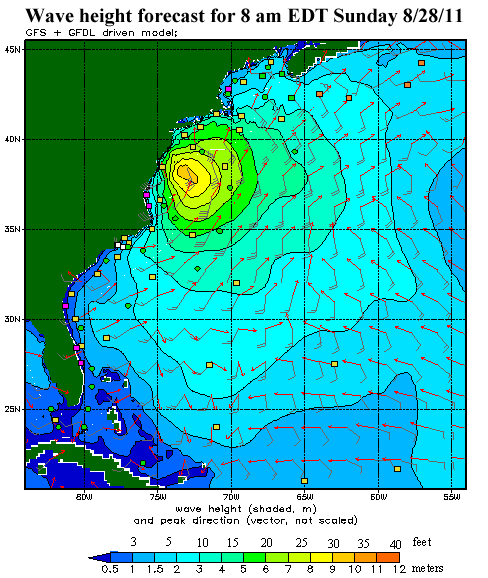 The coast from Virginia northwards through New Jersey will see tropical storm-force winds of 50 - 70 mph from Irene. 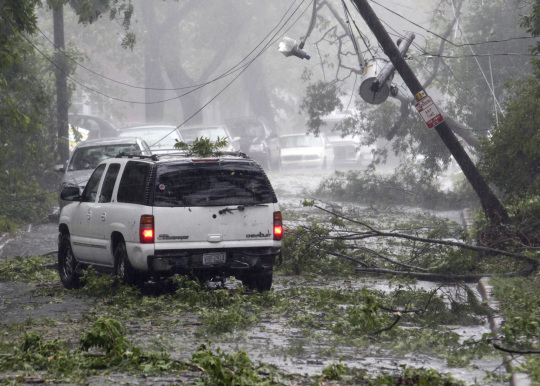 These strong winds, when combined with the torrential rains that are falling, will cause widespread tree damage and power failures that will affect millions of people. When Irene makes its 2nd landfall on Long Island, NY on Sunday, coastal locations to the right of the eye will likely experience top sustained winds of 60 -70 mph. According to a CNN/ORC International Poll, 45% of Americans say they have a stockpile of food and water in their homes in case of a terrorist attack or a natural disaster like a hurricane or earthquake. Those figures are highest in the South and the West -- where hurricanes and earthquakes are most frequent -- but only 36% of Northeasterners say they have emergency supplies of food and water. People who live in rural areas are also more prepared than people who live in big cities: Only 42% in urban areas have a stockpile of food and water, compared with 51% of rural residents. In recent days, though, public officials have made frequent media appearances and taken other steps to indicate that they are ready for the storm. "I cannot stress this highly enough. If you are in the projected path of this hurricane, you have to take precautions now. Don't wait, don't delay," said Obama. "All indications point to this being a historic hurricane." While some were discounting the weakening storm, government officials were clearly concerned that people would dismiss warnings of potentially devastating flooding and ignore calls to evacuate or prepare. In New Jersey, 1,500 National Guard members fanned out across the state and Gov. Chris Christie said more than one million people living along the Jersey shore had evacuated. But he said authorities were worried about 600 high-rise residents in Atlantic City who were refusing to leave their homes. In New York, Bloomberg pleaded for residents once again Saturday to take Irene seriously. But it turned out there remained holdouts on Hatteras and Ocracoke islands who'd boarded up their homes, secured their possessions and settled in - refusing to leave. In response, local officials said they were ordering dozens more bodybags, The Associated Press reported. As Hurricane Irene continues to creep towards New York City we must consider the unfortunate possibility that this hurricane will be similar to the disaster described above. How Does Global Warming Make Hurricanes Like Irene More Destructive? Energy legislation that costs Trillions? CO2 goes up, down and sideways and there are always storms. The only thing that changes are the computer models to explain why the last predicted horror didn't happen and why the next one surely will.